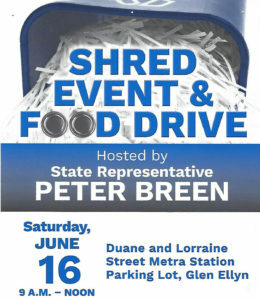 State Representative Peter Breen, in partnership with the Glen Ellyn Food Pantry, is hosting a free paper shredding event and food collection drive. Paper documents will be accepted for destruction (Limit-2 bags or bankers boxes per vehicle), and non-perishable food items for the pantry will be collected. Follow marked pathway through parking lot.